About 200 local leaders and community members came together at McEntee Plaza at the Santa Clara County Government Center Monday afternoon for a brief moment of silence. A rainbow flag was raised in San Jose on Monday to honor the 49 people killed at an Orlando, Florida, gay nightclub over the weekend in the nation's largest mass shooting in modern history. About 200 local leaders and community members came together at McEntee Plaza at the Santa Clara County Government Center Monday afternoon for a brief moment of silence. 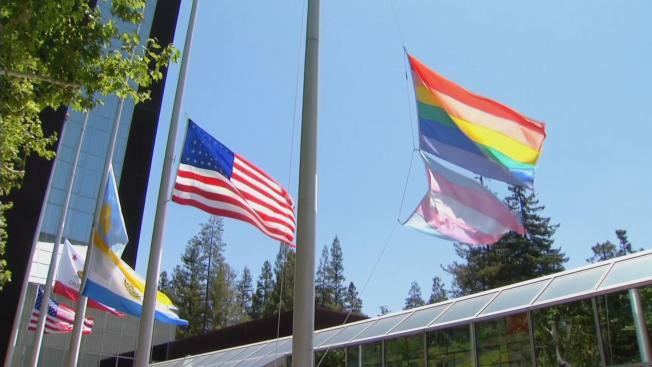 They also heard remarks before county Supervisor Ken Yeager and San Jose Mayor Sam Liccardo raised the rainbow flag in memory of the shooting victims. A sole gunman killed 49 people and injured dozens at Pulse nightclub before he was fatally shot by police early Sunday morning, FBI officials said. During the attack, the shooter made 911 calls from the club stating his allegiance to the Islamic State group. The suspect also had past contacts with federal investigators since 2013, according to the FBI. "This tragic loss of life reminds of the fear and violence faced by so many LGBTQ Americans on a daily basis," Yeager said. "As we gather, we as a community must send a message to the world that here in Santa Clara County, we don't tolerate hatred and violence." "We mourn, but we do not lose hope," he said. Yeager, an openly gay man, pointed to how Santa Clara County established the country's first LGBT Affairs Office at a county level. "This is our moment to use this grief as a means to enable us to find common ground where too many are willing to find division," Liccardo said. "This is our moment to pull together and take a stand." Later Monday, hundreds of people marched through downtown San Jose to City Hall and lit candles for a vigil honoring the Orlando victims. Tamara Alvarado, the executive director of the School of Arts and Culture at the Mexican Heritage Plaza, said the shooting at the club makes her angry. "Those are spaces that are safe for us," she said. "As a woman it’s hard to be out. Those are places where you feel a little safer." Alvarado said people are tired of praying and it's time for politicians to act on gun control. "There's plenty of examples around the globe of policies that work for the people," she said. Back at the government center, Sheriff Laurie Smith called on the public to accept, embrace and love everyone in the community, including LGBTQ people. Smith and San Jose police Chief Eddie Garcia also asked people to report any suspicious acts, no matter how small they may be, and that their forces will be on a higher alert. "We will definitely be looking at providing additional security to the gay bars in the area, and we are working very closely with the Billy DeFrank Center," Garcia said. Maribel Martinez, head of the county's LGBTQ Affairs Office, read the names and ages of the 49 victims as flags were flown to half-staff. More focus should first and foremost be on the victims, said Sameena Usman, government relations coordinator at the Council on American-Islamic Relations San Francisco Bay Area chapter. The LGBTQ community has spoken out after horrific events including 9/11 and now it's time for the Muslim community to stand in solidarity with them, Usman said. San Jose newlyweds Terrence Vargas, 42, and Johnny Zych, 43, took the day off to attend today's ceremony and other events held in memory of the nightclub shooting victims, who they consider part of their LGBT family. They wore Mickey Mouse-shaped pins bearing a rainbow that they bought from Walt Disney World near Orlando. "Whenever I see that flag, it's a symbol of peace for the LGBT community and it represents who we are as a people," Vargas said. "It's very hard for me to know a lot of our brothers and sisters back in Orlando were involved in this terrible tragedy." Said Zych: "I hate that we have come to the point where it almost feels like the norm. Oh, another shooting." The county's Board of Supervisors, San Jose City Councilwoman Magdalena Carrasco, Campbell Mayor Jason Baker and Sunnyvale City Councilman Jim Davis were also at Monday's gathering.